A year ago, I watched a two-part documentary called “Old people’s homes for Year Olds” on Channel 4, an experiment based on the American model of building nurseries within residential care homes. 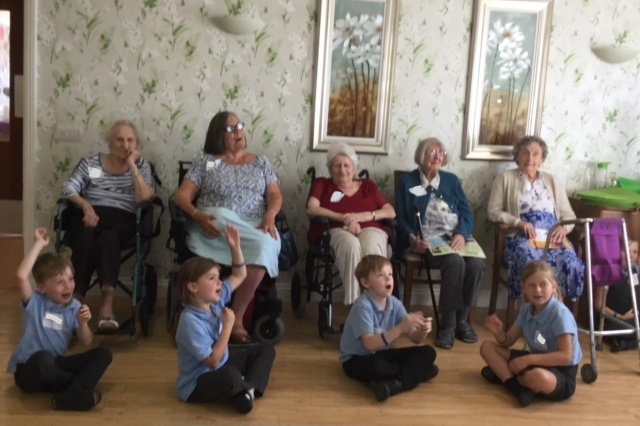 A scheme that proves when isolated older people and primary-school children are brought together the physical, social and emotional well-being of the elderly residents improves dramatically. Inspired by this programme, it got me thinking about the many skills that we have as theatre practitioners and how we should be constantly evolving these skills to use them to reach out beyond what we are trained to do; to new groups, to try new things, to extend our community reach, and to help more people get involved and feel less isolated. GSC has been running after-school Drama Clubs in local Primary Schools for years. Over the course of a term, the children learn a Shakespeare story, and create a 20-minute version to perform in front of friends and family. It suddenly became obvious that there was no reason not to run these classes within a residential care home. Nearly a year later, and thanks to funding from the Community Foundation for Surrey, we started our first day of term this Monday. The first residents to arrive were Elise* and Mary, two ladies aged 92 who eagerly awaited the arrival of the young children. Fred was the third to arrive “I’m very nervous” he said, but shortly after that a party of ten 7- and 8-year olds arrived brimming with youth, energy and excitement. Fred paired up with 8-year-old Lee, and within minutes a new friendship was forged. “We both have lots in common” said Lee “We both like the colour red and football”, as Fred affectionately put a prop crown on Lee’s head. Isabella told me “What I have in common with my partner is that we both have pretty names”. One of the quietest residents, Irene, came into her own, when playing the role of Puck, from her wheelchair, she became engaged and alert, flapping her fairy wings for all the children to enjoy, as she cast her magic spells. “I can’t believe the change in her” said a care worker, “it’s definitely the biggest surprise of the day”. It is easy to instantly see the benefits of diverse age groups working together. 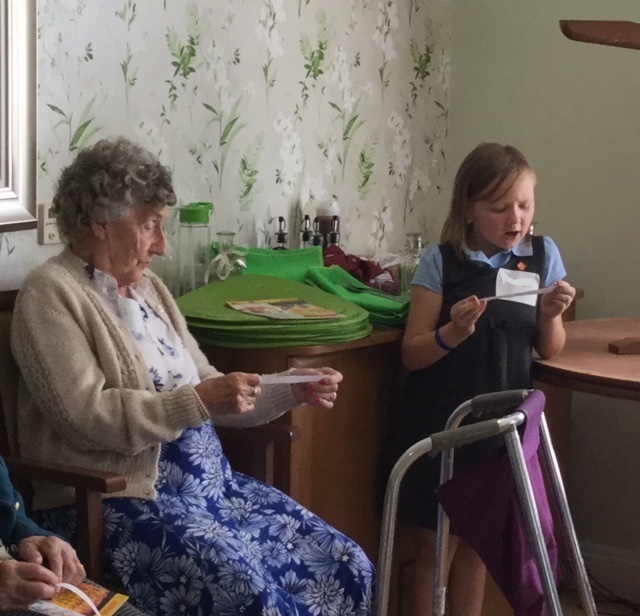 The elderly residents rarely get many visitors and relish watching the enthusiasm of the children; by helping them to read words that they might not have come across before, the older people have purpose again and are vital. 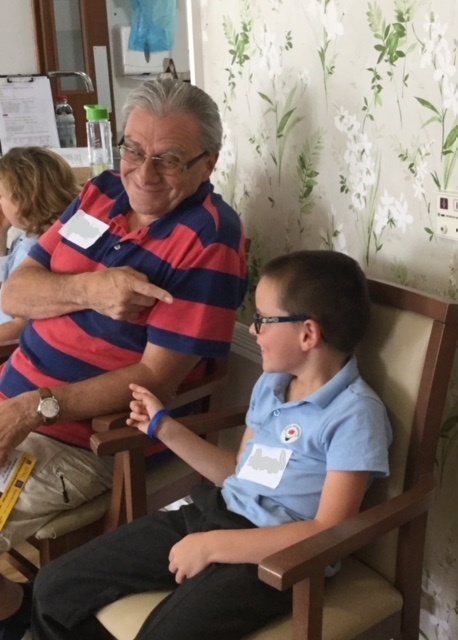 Ultimately young children love attention and to talk, so they thrive from their captive audience within the care home. 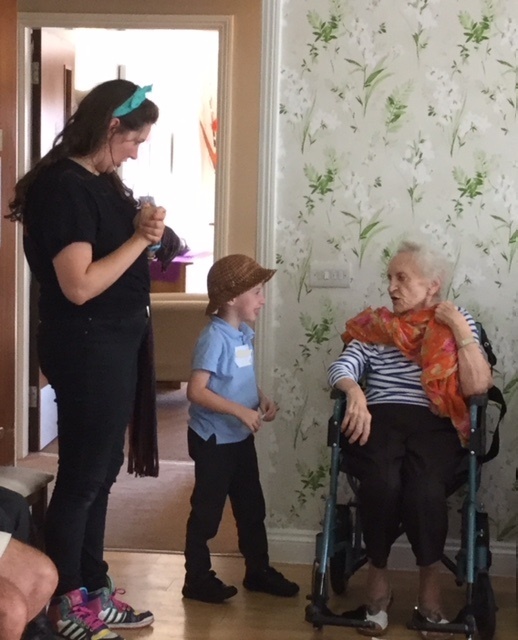 The supportive environment of them working through the play and characters provides enriching experiences for them all and ensures that the elderly residents are more likely to stay actively involved, whereas they might withdraw if only amongst their own peer group. “I think you’ve found your soulmate there” I said to Fred as they children left. “You think so?” he beamed at me “What a lovely boy. I’ve had such a nice time”.